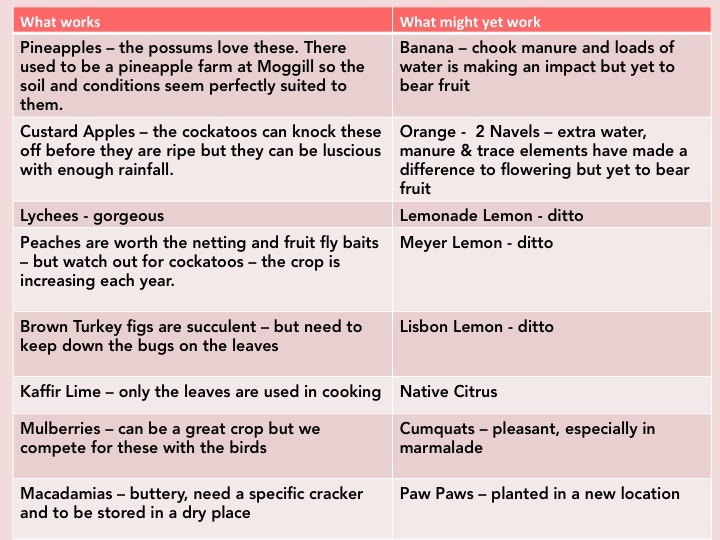 Sometimes in spite of fruit fly baits & netting, pyrethrum spray or organic dust, it still seems as though we are providing the wildlife with beautiful organic food rather than ourselves! Previous owners had created a limited orchard. There were: a black sepoia/ black sapote tree (chocolate pudding), 2 tamarinds , a custard apple tree, 3 strawberry guava trees, 3 feijoa trees, a lemon myrtle tree, a longan tree, 3 loquat trees, a lychee tree, macadamia trees (about 10), 3 mango trees , a mulberry tree, 2 pecan trees, and wax jambu. There was also a monstera deliciosa plant on the fenceline with our southern neighbours. There was a disgusting variety of Burdekin Plum tree on the driveway which has fruit that are as easy to digest as stones! And there was a mystery fruit tree which I have labelled ‘bumpy’ because of its knobbly trunk. In recent times an Indonesian lady, who is a chef, visited us and walked around the ‘orchard’ exclaiming about all the fruit trees that were familiar to her. So there may have been a plan by previous owners to purchase tropical and semi-tropical fruit trees from local nurseries as many of the plants are common in Indonesia. It also explains why many of them are unable to bear fruit as the climate here is not tropical enough. She gave trees their Indonesian name. Lychee – Litchi chinensis- Litchi, which is also in the orchard. *A beautiful tree in the orchard with dark green glossy leaves on the top surface and a bronze sheen underneath – we did not even think it was a fruit tree as we had never seen any fruit on it! 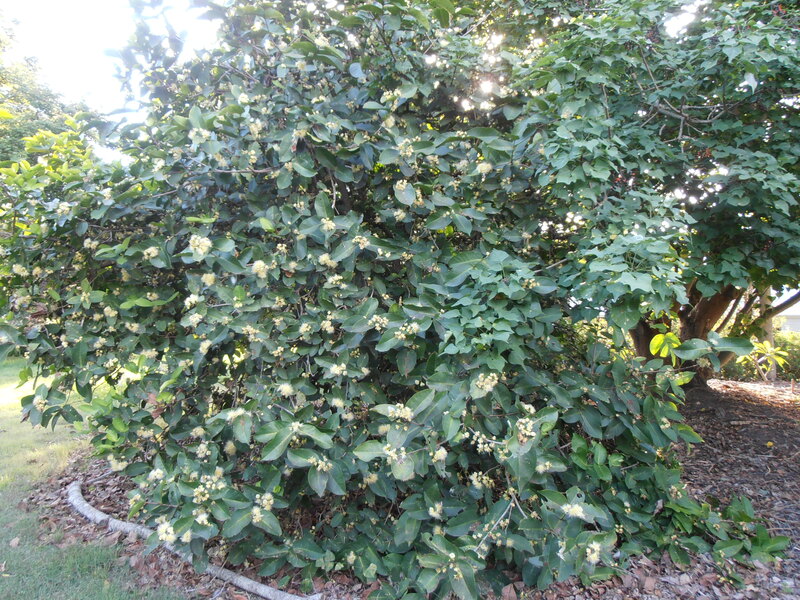 The Herbarium at Mt Cottha Botanic Gardens identified a fruit tree located over near the cottage as Pachira aquatica, otherwise known as the Malabar chestnut, Guiana chestnut or money tree! (Google provides the interesting story as to the use of ‘money tree’ in the sale of the plant.) It may be undesirable because it is an exotic that spreads rapidly. 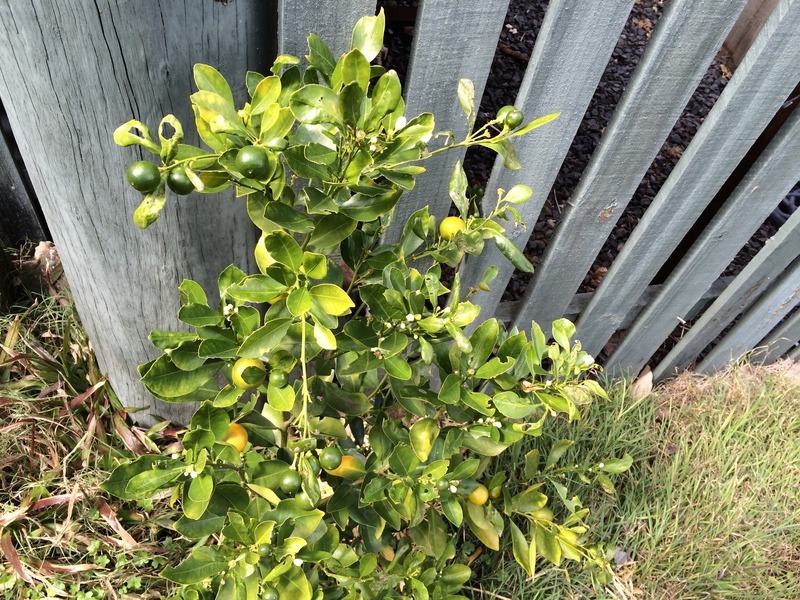 We have added an avocado, a blueberry bush, strawberry plants,3 lemons (a Lemonade, a Meyer and a Lisbon), 2 oranges, a kaffir lime, a cumquat, a peach, a pomegranate, an ice-cream bean tree, 6 olive trees, several passionfruit vines, a few pawpaws, seasonal sunflowers, pineapples, a watermelon vine, a banana plant and a brown turkey fig. But Ian has cut down a few too – a feijoa in the triangle garden as its fruit was always riddled with fruit fly despite many fruit fly traps. The Herbarium at Mt Cootha had identified for us the Strawberry Guava, Psidium cattleianum, a native of South Africa (BioNET-EAFRINET a listed weed). There were 3 and this may indicate that the older and larger one in the front orchard had spread to the clothesline garden and down to near the side gate into side paddock. So Ian cut down these 2 smaller ones. The ice-cream bean tree looked like it was developing into a weed so that too was removed. The 6 olive trees never really flourished so in the end Ian cut down 5 and left the biggest one – there has never been a single olive. After 5 years our original paw paw looked extremely sick and not for lack of water. Possibly it was a case of black spot but Ian cut it down as it was only producing tiny sickly fruit – but he struck 4 more plants with cuttings! it is necessary to put out eco-friendly fruit fly traps at the end of winter on the peach and loquats – we just leave the 2 small feijoas as ornamentals. We also give the peach tree loads of drip water and cover it with netting as the cockatoos will strip the branches even when the fruit is hard and green. The loquat trees are too tall and the fruit is liable to fruit fly even with the traps so we may eat a few locquats but otherwise leave them for the local wildlife. for some reason there has never been much yield from any of the mango trees – probably because of possums! who even chew the stems so the ends of the branches fall to the ground! Ian has implemented a plan for citrus trees to bear fruit – he has dug out the earth and built up bowls of manure and straw (from our horse paddock and our chicken coop) around the base of the citrus trees (not touching the trunk) in order to contain the watering and he has put trace elements into the soil. For the first time the flowers are prolific on the trees and we are hoping that this will translate into actual fruit. 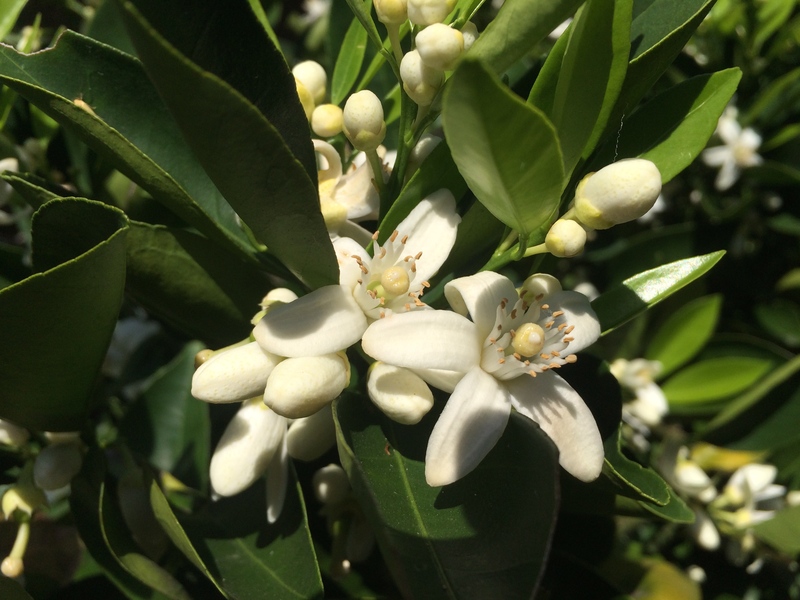 Ahh, the fragrant orange blossoms! We have collected a bucket of macadamias from our side paddock – the best ever bush-tucker food, as the cockatoos will agree! We had a bumper crop in 2012 but lack of rain keeps numbers down at other times. A neighbour also recommends putting them on barbeque to roast – very tasty. When the leaves drop they make fabulous mulch.